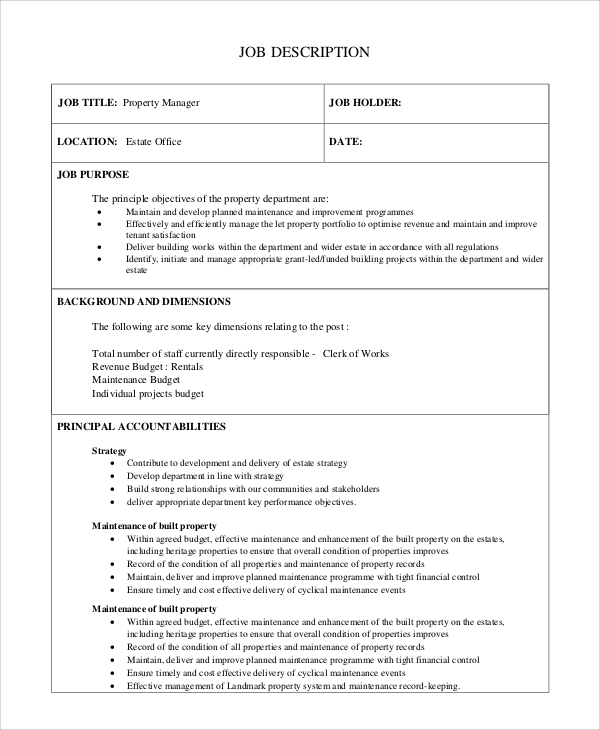 Property Manager Job Description enumerates all the responsibilities and duties expected of the designated person. There are five job classifications listed, and each specifies the role to be executed. Different levels of qualification, experience, and skills have been indicated too, all with the intention of sourcing the best talent available. 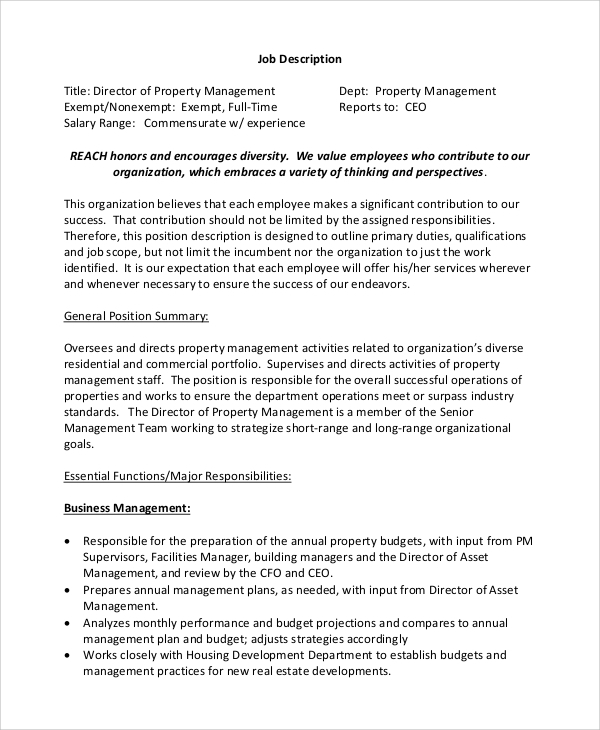 The Job Description Samples is an excellent tool in this regard to identify and select the right candidates. 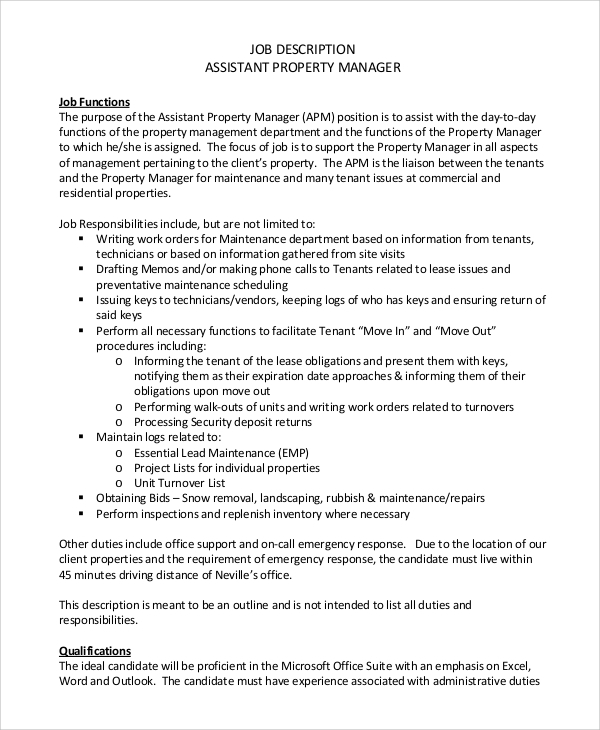 The purpose of this position is to assist in the day to day functions of the property management department, as well as support his/her immediate senior to whom he/she has been assigned. The position has an objective, which is, to monitor the leasing activities of the various property portfolios, to ensure maximum all year occupation and revenue. Ability to multi-task in a fast paced environment will be required when the need arises. The focus here is on being accountable for a combination of leasing activities related to commercial and residential properties. Additionally, serving as a primary liaison between owners and tenants. 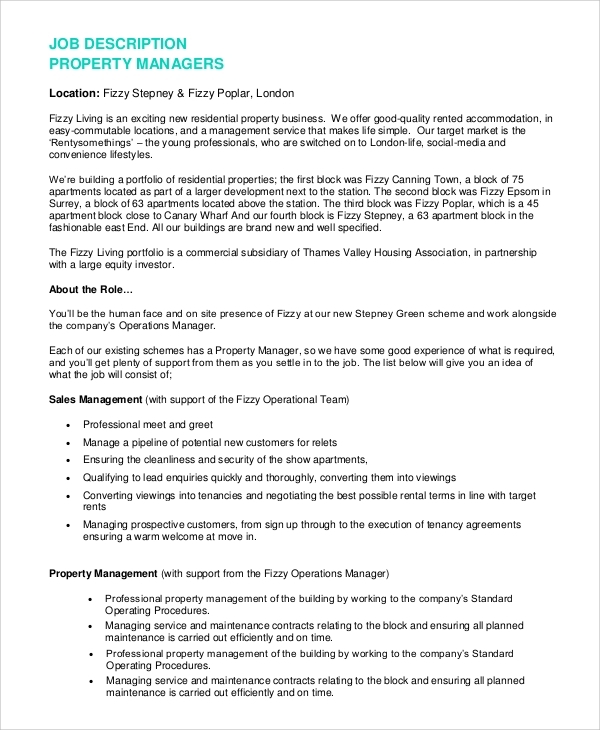 The position seeks a professional with vast experience in handling ‘on-site managers’ as well as monitoring their activities. A quick thinker and a decision maker should have the essential attributes. 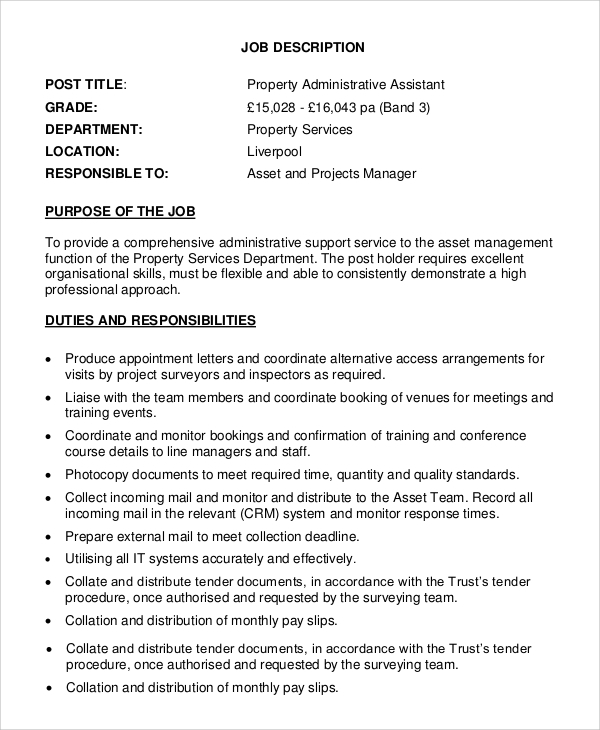 A senior position which comes with a large share of the responsibility while managing numerous group properties. and preparing short term and long term goals and strategies will be one of the primary duties. 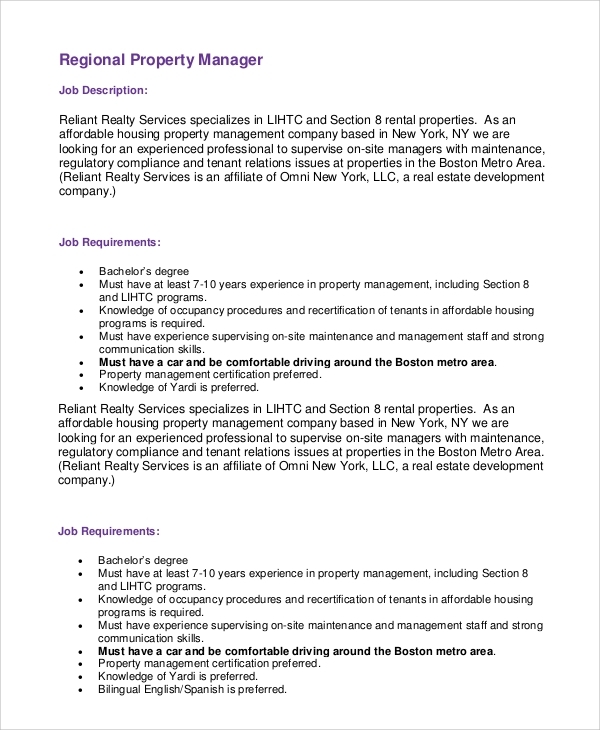 Property Manager Job Description Samples has been researched and documented to source and identify the most suitable candidates. 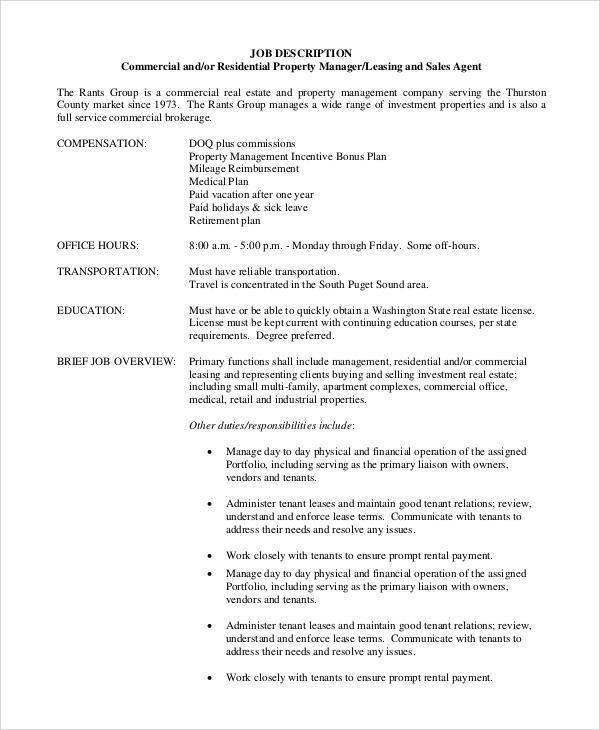 All listed duties and responsibilities are based on the overall functions of a commercial or residential property. Leasing, financial management, maintenance activities, liaison are a few of the primary responsibilities. These factors will be considered at the time of interview to ensure that the prospective candidates possess qualities to fulfill such expectations of the management. Possessing personal characteristics like amenability, endearing personality, communication skills will be an added advantage. Since these descriptions are accurate about the type of candidates required, it helps the organization in identifying the right individual qualified for the job. It will eliminate or drastically reduce the possibilities of receiving applications from candidates who don’t fulfill the necessary requirements. This is a time-saving exercise, and less cumbersome for the employer. 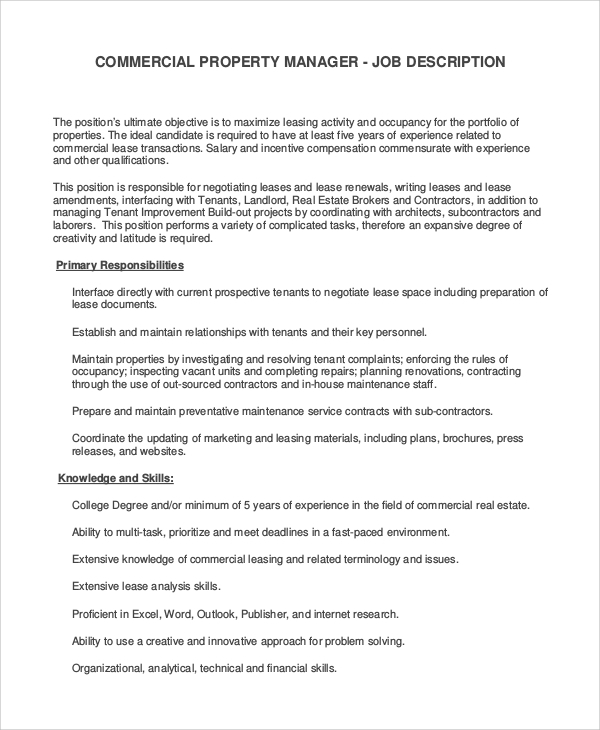 Candidates with relevant qualification, skills, and experience, should only apply for these positions. High levels of skills as well as personal qualities like flexibility, patience, sensitivity, mental strength are factors which will be considered at the time of interview. An extremely resourceful candidate with good networking capabilities will be an ideal choice. 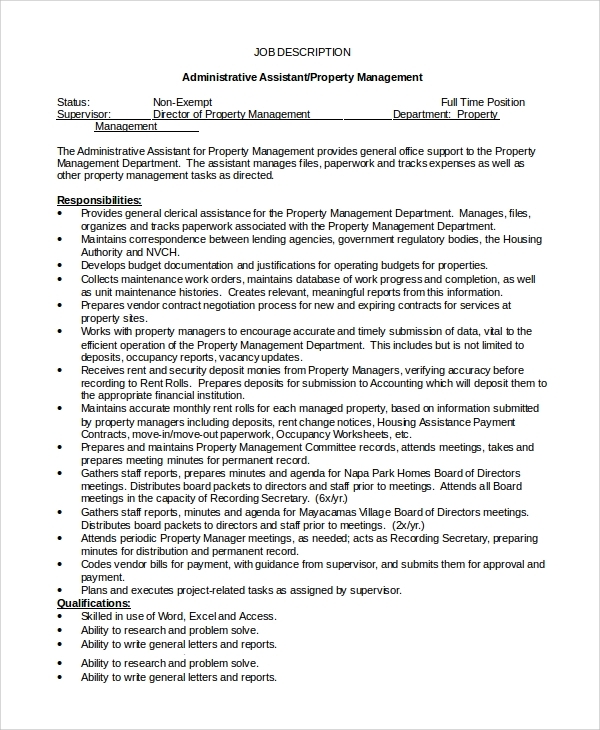 Property Manager Job Description follows a certain protocol in enumerating all the specifics of a job. It is derived after analysing company needs and expectations. After diligent consideration of other relevant departments too, a concise and pro-active description is drafted which best suits the organisation. The Business Analyst Job Description Samples is however different in comparison.